WALBERT YOUNG TTN Students sit in “Race & Poverty in the Americas,” which fulfills a gen-ed race and diversity requirement. 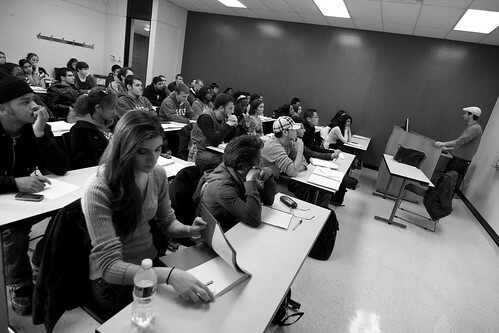 A survey will be available this semester to evaluate the general education program. Utilizing its role as a liaison between students and university administrators, Temple Student Government is set to debut a survey dissecting student perception of the general education program. The five-minute online questionnaire survey is the brainchild of TSG Director of Academic Affairs Zack Groff, and has been in the works since December 2011. Groff considers the unorganized gripes concerning gen-ed classes as one of the primary reasons for initiating the survey, rather than relying on feedback from students in TSG general assembly meetings and casual conversations around campus. Its purpose is to produce a more concise consensus of student opinion regarding the gen-ed program, providing TSG members with more factual data when advocating in front of university officials and administrators after the survey’s results are compiled into a tangible report-like format. The survey consists of 10 “ranking” questions, and a voluntary open response section where students can voice their opinions. Groff added that these specific and organized responses are the missing links in the gen-ed equation. Groff said various university officials were aware of the fact that some students were generally unhappy with gen-ed courses, but without an accurate description of what students really felt, there was little that could be done to try to remedy the situation. A situation, political science professor Alistair Howard said, doesn’t warrant the amount of measures taken up against it. “[Gen-ed classes] help lay intellectual foundations, not disciplinary foundations,” Howard said in an email. But for some students, including sophomore history major Davea Livingstone, those effects are more idealistic than realistic. Livingstone went on to voice a common concern among many students regarding gen-eds, and one that Groff was particularly aware of, in that gen-eds rob students of precious studying time for their major courses. The fact that there is no empirical evidence to support this type of claim is all the more reason Groff views the TSG survey as an imperative to getting students’ voices heard by university decision makers. But Groff, and others who were instrumental in the project’s development, including the gen-ed department and the Measurements and Research Center, said it was important to recognize that there was no guarantee that anything significant would come out of the survey. By comparison, the official university student survey that every student is required to take at least once, and which is scheduled to come out only two weeks after the TSG backed survey, has a response rate of around 16 percent. Junior African-American studies major Kiersten Gibson-Cooper said she would gladly take the survey, adding that gen-ed teachers are too lenient toward the performance of their students. “Some teachers genuinely care about whether or not you do well and the class, and others…they just hand you an A just for showing up,” Gibson-Cooper said. For the first time, Temple Student Government is holding senatorial elections.